Recovering from surgery while waiting for pathology reports is very stressful. So I decided a simple "happy" sewing project was just the thing to brighten my mood. These bright fabrics from my stash made me smile the entire time I was working with them! I hope that my 4-year old little friend Julianna and her mommy like this very "happy" set. The peasant top is from a pattern by an Etsy Seller, Whimsy Couture. I highly recommend her patterns. 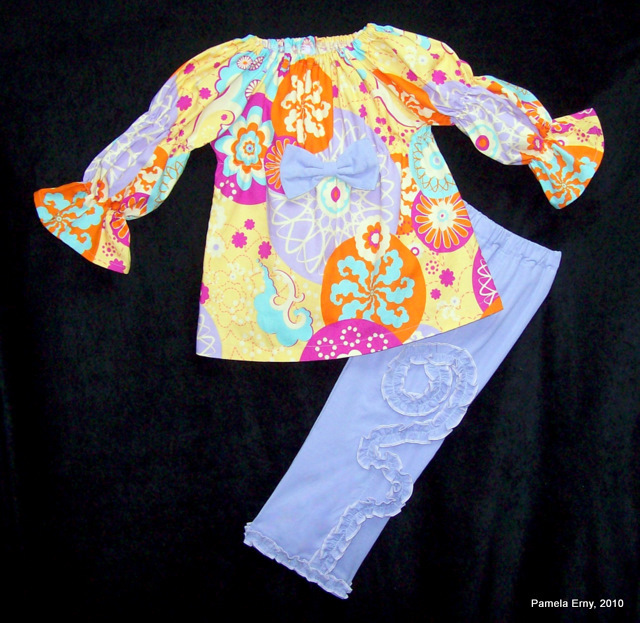 The pants are a basic style from Ottobre Design, that I modified by changing the pant leg width and adding ruffle embellishment.